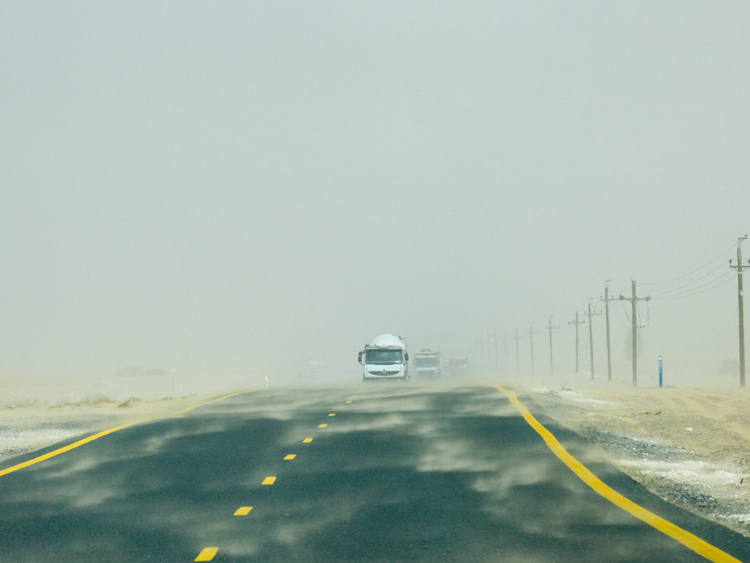 Sharjah: Police in the northern emirates have urged motorists to exercise caution as unstable weather has resulted in slippery roads and poor visibility. Even as a public awareness campaign via Instagram, Twitter, Facebook has been launched, residents have been asked to avoid the sea and not use mobile phones in open areas for their own safety. Police have urged motorists to stay within the speed limit and get their cars cleared from the road if they are stuck. Municipalities have also conducted site surveys to ensure that stormwater drainages are functioning efficiently. A plan has been devised to use pumps and water tankers in areas with rainwater issues. In Sharjah, police have taken all necessary measures to cope with any emergency. Police patrols have been deployed to regulate traffic movement and motorists of heavy vehicles to avoid overtaking and sudden lane changing on highways, and in case of low visibility, pull to a side till they can see more clearly. Colonel Sami Al Naqbi, director general of Sharjah Civil Defence, said it has plans in cooperation with Sharjah Police and Sharjah Municipality to deal with an emergency. The Higher Committee for Rain Emergency, chaired by the Sharjah Municipality director, was closely monitoring the weather. Lieutenant colonel Saif Abdullah Al Falasi, deputy director of traffic and patrols in Ajman, said Ajman Police have increased the number of patrols, ambulances and rescue vehicles, and raised the level of readiness of the Central Operations Room to get to accident sites as soon as possible. People can call 999 in case of any emergency. Colonel Saeed Bin Aran, director of traffic, Umm Al Quwain Police, said police forces were ready for any emergency. Motorists have been asked to avoid flooded areas. In Ras Al Khaimah, heavy rains led to flash floods in the wadis resulting in some road closures. With heavy rain and floods reported in the wadis around Jebel Jais, the road leading to Jebel Jais was also closed. A total of 44 traffic patrols and rescue vehicles were deployed to ensure the safety of motorists. Brigadier Dr Mohammad Saeed Al Humaidi, director general of central operations at Ras Al Khaimah Police, called on motorists to adhere to the safety rules and in case of an emergency call 999 or 901. Major General Mohammad Ahmad Bin Ganem Al Kaabi, commander-in-chief of Fujairah Police, has also intensified traffic and security patrols on all interior and highway roads, especially where there is water clogging. He said a meeting was held with all concerned departments to discuss arrangements to meet any emergency. Close house windows to prevent rain, dust from coming in.